Imagine you’re the owner of a ice cream shop. You own the ice cream shop because you need a way to pay rent every month for your apartment. How would you decide how successful your shop is? The answer seems obvious: you’d judge it based on whether you made enough money to pay your rent. You would probably also keep track of the things that helped you make enough money to pay for rent–what your most popular flavor is, what times and days you got the most business, and which ice cream suppliers provide the best value. Sure, you could keep track of how many people in blue t-shirts bought chocolate ice cream, or whether more women buy vanilla ice cream. But ultimately, keeping track of those things doesn’t actually help you make more money for rent. Shocking plot twist: this post is not actually about ice cream. I’m talking about (dramatic pause)… digital analytics. 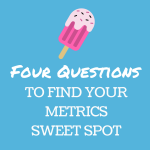 But I’m going to argue that, actually, choosing the right metrics for your nonprofit digital program isn’t too different from deciding which numbers to track for your ice cream store. With that in mind, we’re going to take you through a thought exercise in this post (one that actually involves digital analytics, and not ice cream!) that we hope will be helpful in thinking through which metrics will actually help you accomplish your goals. Let’s say you’re trying to increase engagement on your email list, and your operating theory is that a donation to your organization is a strong indicator of engagement. So, you get your team together and brainstorm ideas for a kickass fundraising email. You land on one that seems pretty compelling, and after days of revisions, you have your final copy, ready to send! After it’s sent, you wait anxiously, watching the results roll in. The next day, you’re ready to convey the results to the team. How did your email do? Your first thought is to look at email open rate. After all, open rate should give you an indication of whether your email is a success, right? After thinking it over, though, you realize that since people don’t know what’s in the email before they open it, open rate doesn’t really represent how people felt about the email — it’s more of a reflection on how compelling the subject line was. Instead of open rate, you need a metric that’s going to tell you how people responded to the email. Since this was a fundraising email, you decide to consider the total amount of money that you raised. That’s definitely an indicator of success for this email. However, after talking it through, one of your team members raises the point that this number could be really skewed by a small group of major donors. Just one person making a really big donation could really inflate this metric! But if total donation amount doesn’t cut it, what else is there? Another member of your team suggests looking at the number of donors. Looking at how many people donated will certainly help you figure out whether supporters were moved by your email’s theory of change. It seems like you’re almost there… But the point of creating this email was to get broader engagement from your membership. What if most of the people who donated are folks that regularly donate to your organization? Does that reflect the aim of this email? Finally, inspiration strikes! You realize that the metric you’ve been searching for this whole time is first-time donors! Looking at the number of people who become donors because of this email will allow you to see, for this email and for all fundraising efforts moving forward, how many people are deciding to add their monetary support to your movement for the first time because of the specific approach. Choosing metrics is hard, and the right ones don’t necessarily come from the built-in dashboards our tools provide. But thinking back to the ice cream example can actually help guide your decision-making. We suggest that you ask three questions to guide your digital program in deciding which metrics make sense for what you’re hoping to measure. You’re going to start broad. What’s your organization’s equivalent of “making enough money to pay rent”? What is your ultimate goal–the whole reason your organization exists? Maybe it’s to provide health services to as many trans folks as possible, or to protect land from deforestation, or to get more women in STEM jobs. Then: How does your digital program contribute to that goal? Maybe it’s by fundraising so that your organization can keep its lights on, or by converting someone who clicked on a Facebook ad to someone who shows up to a local townhall meeting, or by building a community of informed advocates for your cause. Your third question is about any ideas you have for campaign tactics: How does this tactic help achieve the goal of your digital program? It could be as simple as the fact that sending a fundraising email gets more people to donate money, or that a Facebook post about an upcoming action tells your supporters where and when they should show up. The last question: How will you know if this tactic helped to reach the goal of your digital program? Maybe you need to raise $3,000 from email fundraising this month, and you’re sending out two fundraising emails. So success would simply be raising $3,000. But maybe you’re hoping to expand the number of people donating to your organization by 2 percent per month–then, success might look like increasing the number of new donors. There are a variety of different metrics that you can track–what’s important is that each metric you’re tracking is correlated to what you’re hoping to accomplish. You should feel ready to take your digital goals and metrics to the next level! Start by asking those simple questions, and seeing whether your current metrics fit with your goals. It’s never too late to switch up your metrics–it’s not even too late to look at past campaigns through a new metrics lens that better reflects your desired goals. This framework should empower you to create results-driven campaigns that directly align with your organization’s needs. Questions? Comments? Want to share what your goals are? Let us know in the comment section below!